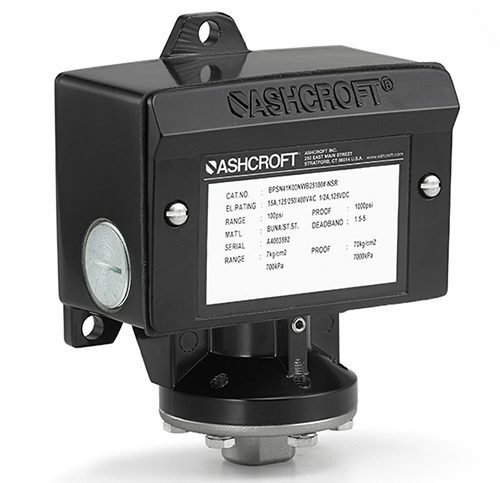 Ashcroft® series B pressure switches have proven reliable in such harsh environments as: offshore oil rigs, chemical and petrochemical plants, pulp and paper mills, steel mills, power plants, water and sewage treatment plants, and other corrosive environments. Ashcroft® 1259 process pressure gauges are used throughout process and industrial markets. They are known for their reliability, safety and performance. Standard features have been engineered to satisfy harsh requirements, while the wide selection of pressure ranges and options make this product an exceptional value. Ashcroft® 1038A process pressure gauges are used two display two separate input pressures on the same gauge for comparison purposes. Ashcroft® 1008S stainless steel gauge is ideal where safe and reliable pressure measurement is essential. It can be used in pumps and compressors, specialized OEM equipment, hydraulics and pneumatics and food and beverage applications. Ashcroft® Type 1005P pressure gauges are commonly used on compressors, filter regulators, fluid power equipment, medical equipment, pool and spa filters, automotive diagnostic equipment, beverage dispensing equipment, industrial machinery and a variety of other applications.